The signal path consists of a matched discrete transistor front-end, premium IC's, and transformer output stage. With the push of a button, the MP5.0 can change from an "Transformer-Balanced" output to a "Active-Balanced" output. The compact 1/2 rack format of the MP5.0 can easily be rack mounted and combined with the Speck Model ASC equalizer to create a highly functional outboard channel strip. The MicPre 5.0 also includes a mix section that makes it perfect for DAW's and remote recording. The MP5.0 is more than a mic pre. It gives you a surprising number of signal routing alternatives. Just use your imagination when plugging up the MP5.0. Since the MP5.0 works with balanced or unbalanced gear, you will not be stuck looking for the proper cable or worrying about level compatibility between dissimilar gear. 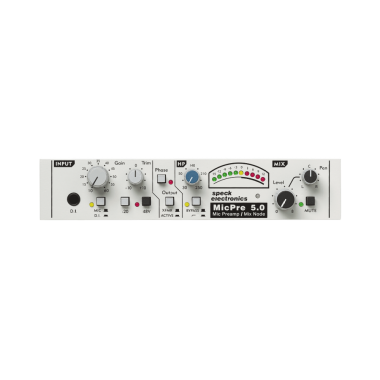 The mix section of the MicPre 5.0 provides a separate left/right mix out with level, pan and mute. With only a simple interface cable, this mix section, or "Mix Node" can be linked with any number of MP5.0's to form a fully integrated mix section. 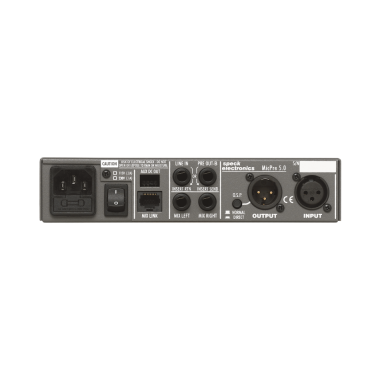 In many situations such as desktop or location recording, this expandable feature of the MP5.0 can eliminate the need for a separate audio mixer. Dimensions: HxWxD=1.75" x 8.5" x 8.00"